I dreamt about this destination for a long time, finally I was there and the place gave me a feeling of peace and inspiration. The southern most town of the world breathes a special atmosphere, it is everywhere and yet it is hard to define what makes this place so special. Maybe it is the ultimate end-of-the-world feeling, the freedom to know that when you look out over the water, that out there is only more water, ice and snow of Antarctica, the last true wilderness of the world. 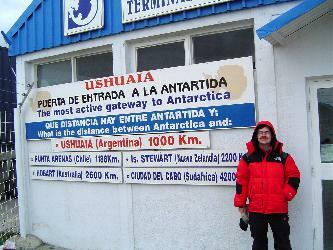 We arrived with the airplane from Punta Arenas, a 30 minutes flight. The landing was quite exciting as the plane has to land on a relatively short runway and comes in flying low over the surface of the Beagle Canal. 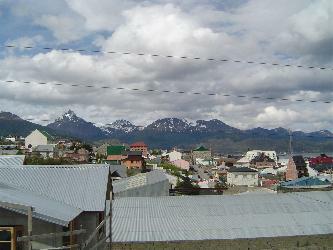 The airport is only 15 minutes away from Ushuaia centre. The hostel we were staying was a real charm , the owner told us from the first couple of minutes to check out the dining room on the fourth floor, he was proud of it, and he should be, because the almost 360 degrees view was absolutely stunning - from one side the mountains, the '5 brothers' and the Martial glaciar, to the other side the town of Ushuaia and the Beagle Canal with the port and the sailing boats. At this point I was already convinced of the special atmosphere of this place, and I knew the following three days were going to be great. The city itself is of course a touristic place, with the usual souvenir shops, tourist agencies, restaurants - most of them with great food, especially the seafood and some of them in truly romantic locations - and even casinos. But walking in town here feels just great, not only because of the very fact that this is the southern most city in the world, but also because as soon as you climb some uphill streets - and they are really uphill here - you can enjoy the silence of mountains, the sea and start dreaming away. 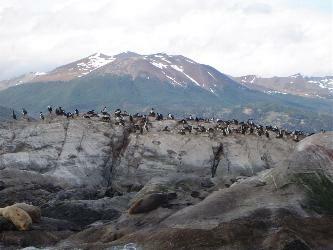 The city has some interesting museums, I visited the one about the indigenious Yamana people, which adds yet more atmosphere to the Ushuaia experience, and the 'Fin del mundo' museum, which covers exploration of Tierra del Fuego and Patagonia, and has besides this a nice stuffed birds collection. 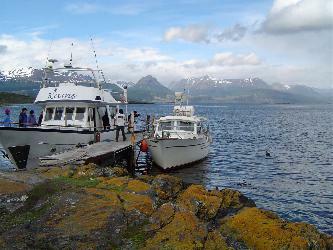 This canal is the passway from the Atlantic to the Pacific ocean, and is dotted with little islands and rocks. Big boats must be very carefull here, but we were going on a small boat today, as we intended to see the wildlife, and even walking on a little island ! On the cliffs of the rocks, the cormorants make their nests, and there are thousands of them, they share the rocks with the sea lions on some places - the little boat went very close to the cliffs, and the experience was great, but maybe the animals didn't like the intruders that much. After a while, we went ashore to do some walking on a small island that used to be inhabited by the Yamana - rests of their campment are visible here. The island was a great experience, you are really in the middle of the Beagle canal, you can feel the wind and the rain and you really feel like an intruder into the daily life of the birds that made this island their home.